I became aware of a screening of the episode of Anthony Bourdain’s Travel Channel show, No Reservations, featuring Tijuana and Mr. Plascencia, so I made a reservation to attend the fiesta. The first person I noticed when I arrived was Mr. Plascencia himself behind the fish market counter working with his staff. I had a couple words with him about the menu and the episode. He is a friendly and down to earth guy. The manager that evening sat me at my table and went out of his way to make some recommendations of food and beer. 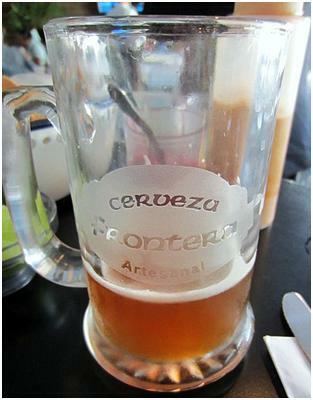 His recommendation of a local beer called “Frontera” and had the blonde(guera) version was excellent. The beer was from a microbrew that I had yet to hear of at the last Tijuana Beer Festival but had great balance and taste. The entire staff at the event was quick, attentive and friendly. I was especially impressed how smooth the operation went, considering the place was overflowing with people and all tables full. I was given a sheet of Plascencia’s recommendations as well as the full menu. Most of the recommendations were items already in the menu. I ordered the Ostiones Asados Al Carbon which were Oysters grilled with a ponzu sauce (en.wikipedia.org/wiki/Ponzu) and chicharron sprinkled on top of the oysters. I believe there was also some thinly sliced ginger. The flavor of the chicharron combined with the smokey ponzu style oysters was a perfect example of Japanese/Mexican fusion at its best. 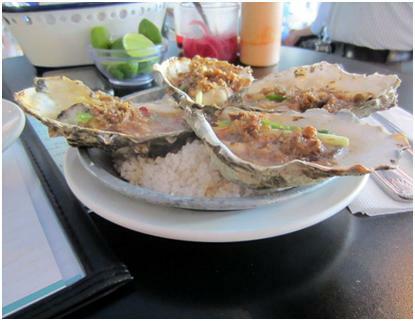 The plate only came with 4 oysters at 75 pesos but I ordered a second order for my assistant who was raving about the oysters. For my next course, I was tempted to order the Abalone but decided to taste a wider parameter of flavors. First, I ordered the Chicharron de Atun taco; ahi tuna that has been fried and caramelized to mimic the pork chicharron that is so popular in Mexico. 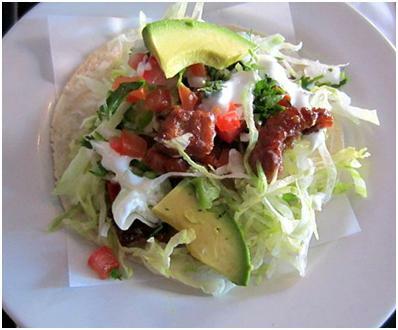 The taco also had the ponzu sauce and some guacamole. It seriously tasted like Ahi candy and is something that I doubt many will be able to replicate. I wanted to follow up with an order of the Oyster taco in tempura batter with kimchi but that had ran out at the moment…maybe next time. Next up was a ceviche tostada called Jurel Ahumado en casa. Jurel is a horse mackeral and, in this dish, was served smoked on top of a tostada with sliced peppers and red onions. The citrus/smoke combination was both refreshing and savory. 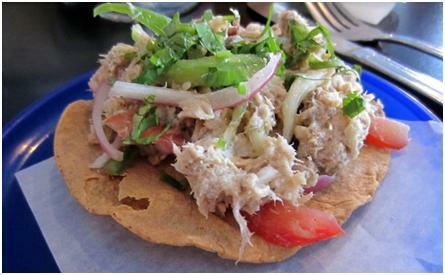 It will be interesting to see if more smoked fish dishes are incorporated in ceviche dishes. I then asked the waiter to bring me the wine list . It featured an extensive selection from the local Guadalupe Valley, including one of my favorites: LA Cetto. I decided that one glass would be enough and had the house LA Cetto Riesling/Chenin Blanc. I am not a wine expert but the wine was crisp and not too acidic. 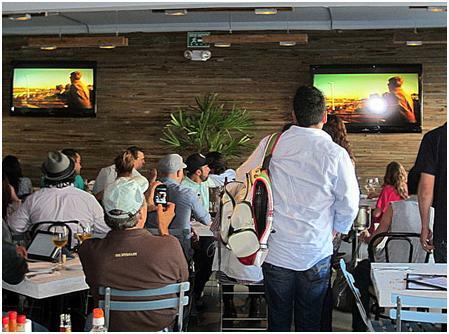 I watched the show for a while but could barely hear the episode as people were cheering the various guests of Bourdain that happened to be at the restaurant that day. Even the pink stretch limo that figured so significantly in the show was parked out front (I noticed the hood was up again). I was happy to see one of my favorite places La Mezcalera get some notoriety but disappointed to see Kentucky Fried Buches, Mision 19, Popotla, Ensenada fish tacos and Taco Row in Cacho mentioned for the upteenth time on a Baja food show. Do we really need to see another review of La Guerrerense in Ensenada? There are hundreds of unique restaurants that should have been mentioned and one of them is in this article. I finished my meal with a Taco Pibil de Pez Espada with Pineapple and Red Onion. Pibil cooking is a process popular in the Yucatan Peninsula that involves wrapping the meat (usually pork) in banana leaves after marinating it in sour orange and achiote (a sweet, slightly peppery red sauce made from annatto seed). 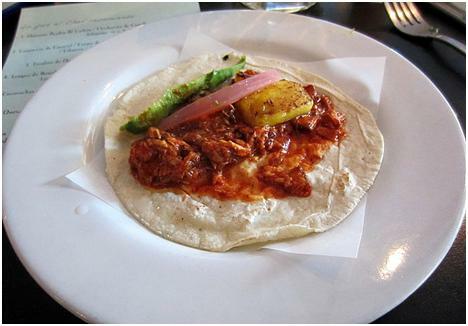 In this case, the swordfish had that same Pibil flavoring, although the achiote was not very pronounced. I finished the meal with a fairly unknown Cabo San Lucas beer called Diablo Blanco that was reminiscent of Victoria beer. I noticed the price of most of the items was particularly cheap, considering the quality and inventiveness of the dishes. Most tacos were less than the garbage Dorado tacos you see at most taco shops in the US. I had a quick chat again with Mr. Plascencia but he was busy in the kitchen making sure every dish was prepared correctly and ready to go. 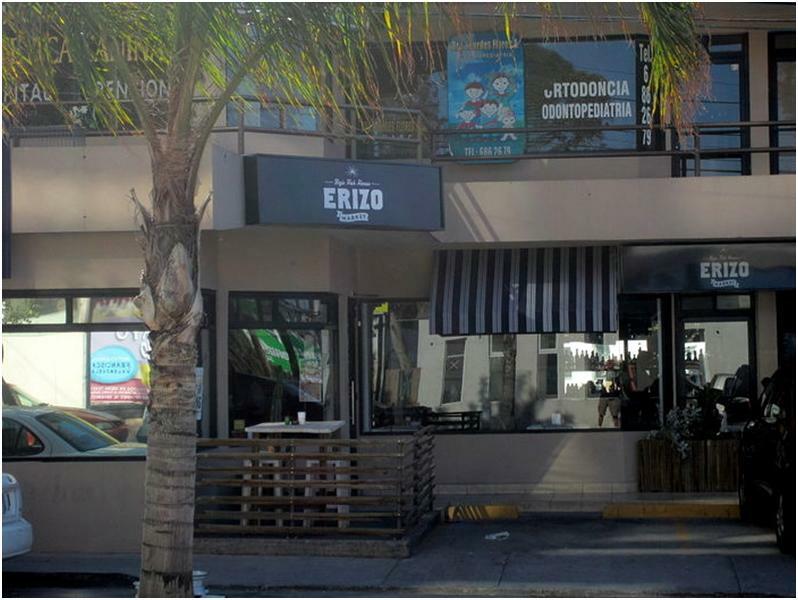 It is this kind of attention to detail that will keep places like Erizo around for years to come.